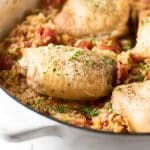 Juicy roasted chicken thighs on a bed of flavorful rice made with leeks, garlic, tomatoes, and a splash of white wine. 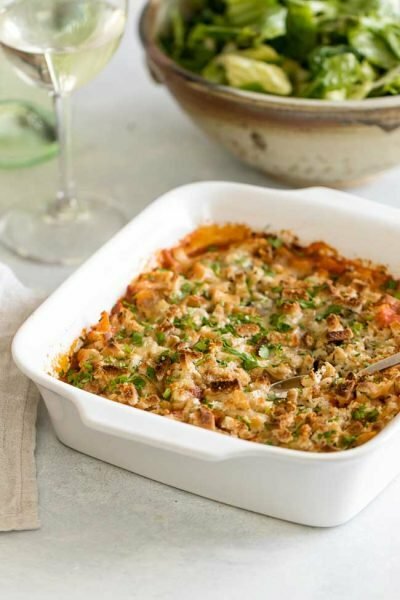 Easy enough for a weeknight, this tomato leek rice with roasted chicken takes about 40 minutes start to finish with minimal prep and clean-up! In life we face many choices and I recently mulled over an important one: rice or pasta? 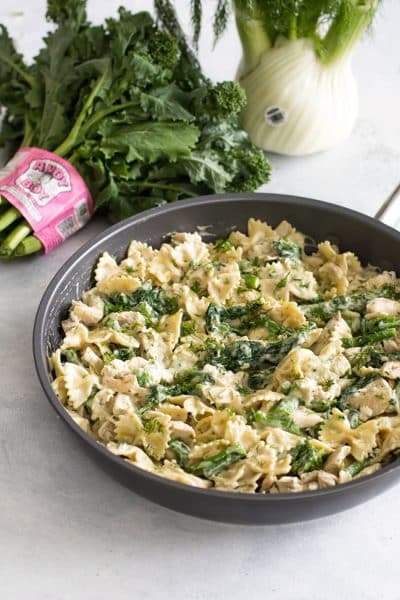 It’s normally an easy choice – pasta for the win! – but a quick glance at the archives revealed what may be a serious pasta addiction and I thought, “do I have a problem?” The answer to that question is a resounding ‘Yes!’ (did I mention I am happily addicted? ), so I figured it was time to switch things up and create a dinner centered on the long-neglected bag of rice in my pantry. Pasta may be my go-to, but this isn’t my first rice rodeo and mistakes of the past helped inform my actions in making this tomato leek rice. First rule of rice club? 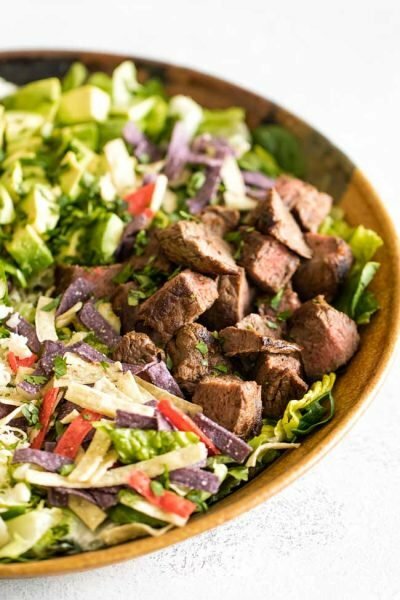 Add lots of flavor. 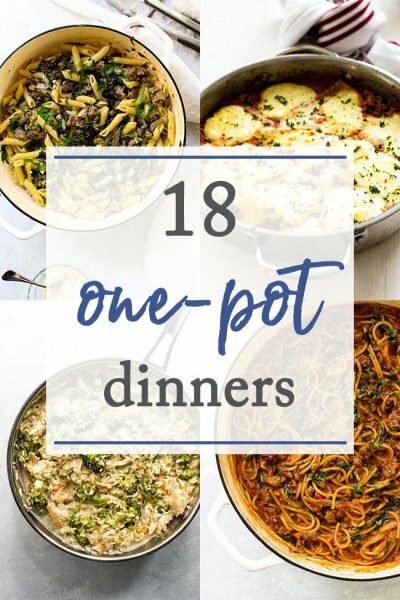 It’s not enough to just boil the rice in some water, plop the roasted chicken on top, and call it dinner unless you like bland, buffet-style suppers, which I’m guessing you don’t. 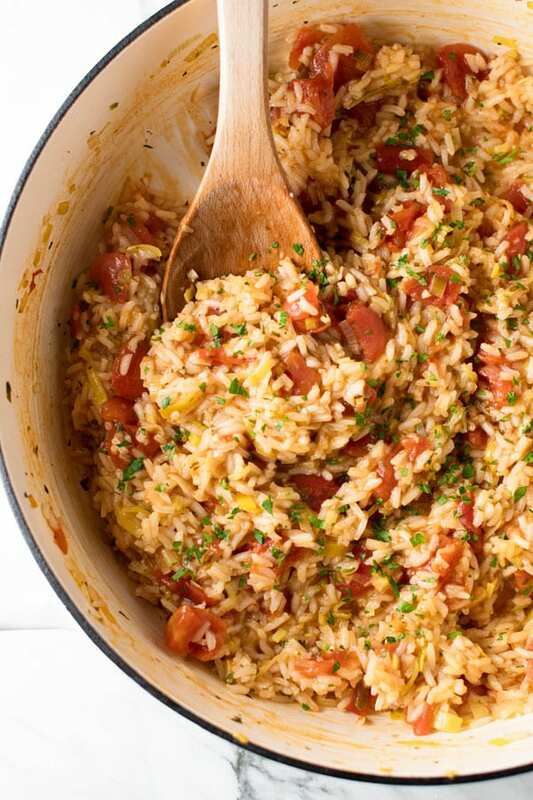 A few simple steps takes plain old white rice to a new level and it all starts with some leeks, garlic, tomatoes, and a splash of white wine. All that deliciousness simmers on the stove before adding some chicken stock and, finally, the rice. 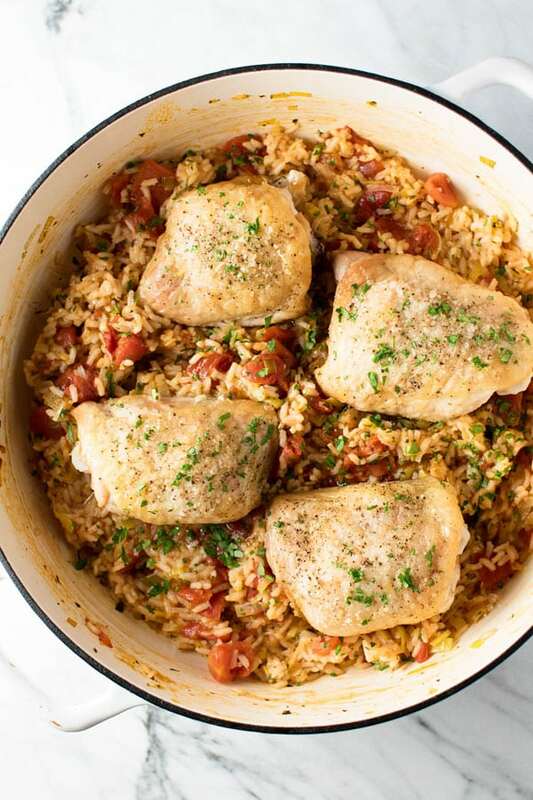 In the space of twenty minutes, the rice soaks up all the liquid leaving the perfect resting place for some juicy oven-roasted chicken thighs. 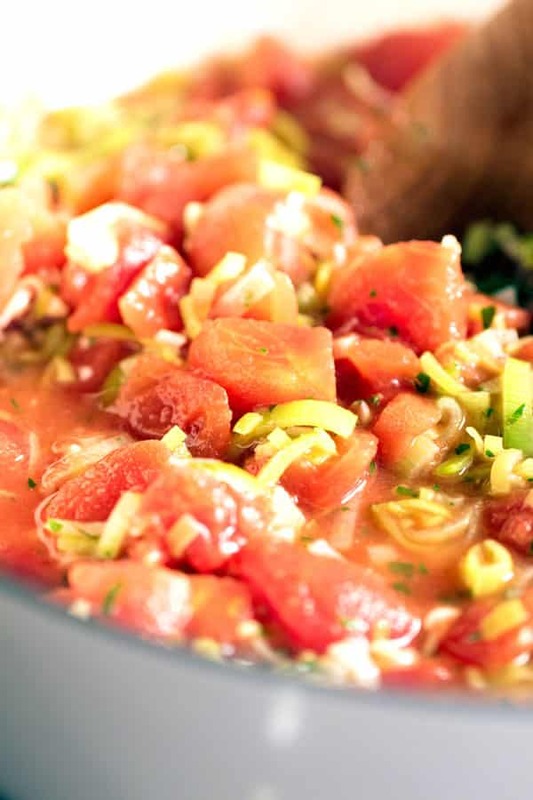 Serve it family-style so everyone can grab a thigh and a scoop of the tomato leek rice. First, preheat the oven and while it heats slice the leek, mince the garlic, and chop the parsley. 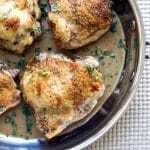 Line a baking sheet with tin foil, place the chicken thighs on it, drizzle them with olive oil, and season with salt and pepper. Pop the chicken in the oven and set the timer for 30 minutes. While the chicken roasts, make the rice. Heat the olive oil in a large pan and cook the leeks and garlic for a few minutes. Add the white wine and let it bubble and simmer until it’s almost evaporated. Add the parsley, tomatoes, chicken stock and rice. Cover and bring to a boil, then lower the heat and let it simmer for 20 minutes. Give it a stir every once in a while to prevent the rice from sticking to the bottom of the pan. When the chicken’s done, check the internal temperature (should read 165 degrees), place the thighs on the rice, and serve! I used simple long grain white rice. You can substitute other types of rice, but you may need to adjust the amount of chicken stock and the cook time. Refer to the rice package for recommended liquid amounts and cook time. If the rice takes longer, just cover the chicken with tin foil to keep it warm while the rice finishes cooking. Use a dry white wine that you like to drink – Sauvignon Blanc is a nice choice. 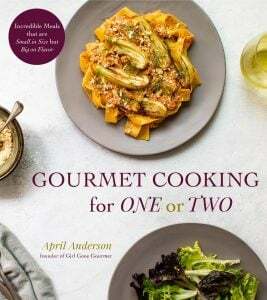 You only need a 1/4 cup leaving plenty to serve with dinner (or to sip on while you cook <— my favorite thing). I used chicken thighs, but chicken breasts would work well, too, if you like white meat better than dark. Again, this may change the cooking time depending on the size of the chicken you use. 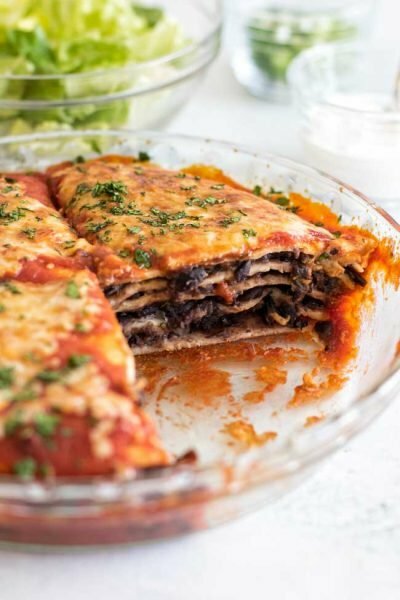 Use whatever herbs you have on hand – I used parsley, but fresh thyme, basil, or cilantro would also work well. I’m a cook-for-one person, so I shredded the leftover chicken thighs, stirred it into the rice, and packed it all in single-serving containers to reheat for easy lunches and dinners later in the week. 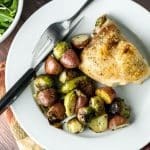 Chicken, brussels sprouts, and red potatoes roast together on one sheet pan. So easy! Pan-seared chicken thighs in a buttery wine sauce. 35 minutes start to finish! 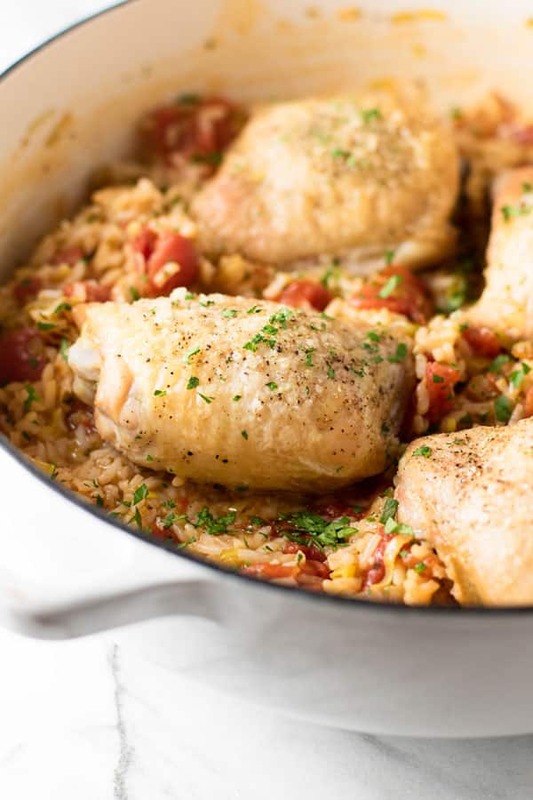 Juicy roasted chicken thighs on a bed of flavorful rice made with leeks, garlic, tomatoes, and a splash of white wine. Make the rice while the chicken roasts and dinner is on the table in about 40 minutes. Preheat the oven to 425 degrees. Line a baking sheet with tin foil and place the chicken thighs on it, skin side up. Roast the thighs for approximately 30 minutes, or until the internal temperature reaches 165 degrees. Make the rice while the chicken roasts. Heat the olive oil in a large pan over medium heat. Add the sliced leek and garlic. Cook it for a couple minutes until it starts to soften. Add the wine and let it bubble and simmer until it almost disappears. Add the tomatoes, parsley, salt, chicken stock, and rice. Stir it all together, bring it to a boil, then reduce the heat to a simmer. Cover the pan and let it simmer for 20 minutes. Check on it every few minutes to make sure the rice doesn’t stick to the bottom of the pan. Once the rice is cooked, check the seasoning and add another 1/4-1/2 teaspoon of salt, if needed.